to join you in the “Bowling for Dads” on Father’s Day Bowl-a-thon! REGISTER to BOWL (outside of Las Vegas)!!! IF UNABLE TO ATTEND “BOWLING FOR DADS” ON FATHER’S DAY!!! 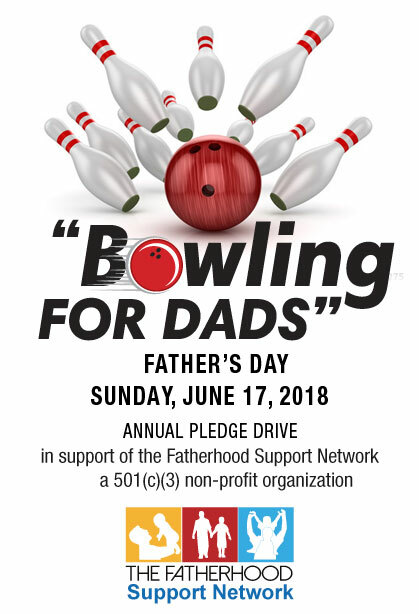 The Fatherhood Support Network is looking for Group Leaders to organize Bowling Teams in the cities where they lives as well as other volunteers locally and nationally. “BOWLING for DADS” on Father’s Day is an annual fundraiser that takes place at Bowling Centers all across the country. The goal is to create an annual tradition of honoring, celebrating, and having fun on Father’s Day with dads who are actively involved in the lives of their children while raising funds for the Fatherhood Support Network. The net fundraising proceeds help support the Fatherhood Support Network’s training of Fatherhood Mentors across the country, one-on-one mentorship activities, and the coordinating of other positive family events such as “DAD’S NIGHT OUT” (held in April of each year). The Fatherhood Support Network is a 501(c)(3) non-profit organization. IDENTIFY a BOWING CENTER in your local community and “Reserve” one or more lanes to BOWL on FATHER’S DAY. BOWL on Father’s Day Sunday, June 18, 2017. HAVE FUN!!! TAKE PICTURES and SHARE PHOTOS on Social Media.